This class covers basic first aid certification skills This is a hybrid First Aid course. 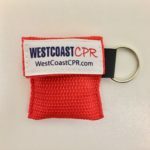 Blended first aid certification classes are a combo of an online first aid course, and a quick 30 minute CPR skills session at WestCoast CPR training center in Shoreline. First aid certifications are valid for 2 years and comply with OSHA and workplace requirements. Receive a First Aid certification card immediately upon completion of class. No written test required. The video-based online First Aid course will be emailed to you within 15 minutes of registration. You will need a high speed internet connection and a flash player. Online Training Time: Learn at your own pace, Typically takes 45 minutes. Is this considered an online First Aid course? No, because our blended First Aid classes are only partially online. A hands-on first aid class is included in the package. First aid app for your smartphone, First Aid handbook pdf, and receive courtesy reminders in 2 years 60 days before your First Aid certification expires.